This view taken by Bennett from the rooftop of the Railway Exchange Building, Michigan Avenue, shows the future Grant Park prior to its development and to the infill land to the south where the Field Museum later would stand, at this time still in the lake. This is one of a series of study views by Bennett over a decade-long period, showing the way people move through the spaces, across bridges, etc. On the open fairground across the railroad tracks and freight yard is a military encampment. 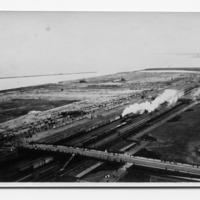 Bennett, Edward H. (Edward Herbert), 1874-1954, “Grant Park, aerial view, Illinois Central Railroad Tracks (no.1),” Digital Collections - Lake Forest College, accessed April 26, 2019, http://collections.lakeforest.edu/items/show/1895.